65% of 25-49-year-olds speak to their voice-enabled devices at least once per day. (Source: PwC). Voice search is widely adopted by all ages, especially millennials and Gen X, with the majority of searches centered around saving time and creating a seamless experience. For example, voice searches are used when driving or doing other activities while using your assistant on the phone or a device in home. Top commands are asking for directions, weather, news, etc. 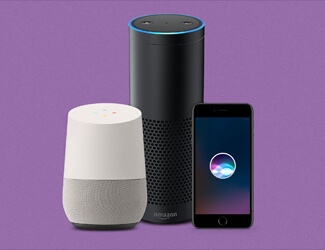 The younger audience typically uses voice commands more frequently regardless of being at home or out while the older audience tends to use it solely at home. As voice search is adopted and used more frequently, this technology will become an expected experience rather than a sporadic tool to save time or typing. Half of all online searches will be voice searches by 2020. The voice search revolution is dramatically altering how consumers engage with businesses and continued change is expected. Marketers who optimize their SEO for voice searches will gain the advantage in today’s new landscape (Source: ComScore). Coincidentally, Google confirmed an update to the core algorithm on March 12th. Google updates the algorithm regularly with minor adjustments and also pushes out definitive changes in core updates. The details of the update are typically not disclosed by Google, but the industry will share data found to get a grasp on what was affected. The last few updates are focused around Expertise, Authoritativeness, Trustworthiness (E-A-T) and Your Money or Your Life (Y-M-Y-L) from the Google search quality evaluator guidelines. In order to accomplish E-A-T guidelines, content needs to be written by accredited qualified experts among additional best practices. Y-M-Y-L is content that is heavily influential for decision making. Both of these guidelines are focused, but not limited around medical, financial and legal content. As voice search progresses and advances, E-A-T and Y-M-Y-L content, with quick load times, will have the upper hand as voice search becomes more of a need than a luxury. If you have seen a fluctuation in website traffic or want to optimize for voice search, contact Oxford for an SEO audit & discussion.